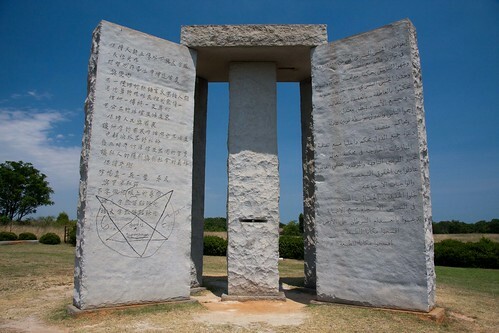 These large tablets in Elbert County, Georgia, USA, known as Georgia Guidestones, were built under a cloud of mystery in 1980. Reportedly some unknown persons hired a granite finishing company to build the structure. These lists Ten new Commandments in eight different languages - English, Russian, Hebrew, Arabic, Hindi, Chinese, Spanish and Swahili. There is also a short explanatory note in four ancient languages - Babylonian Cuneiform, Classical Greek, Sanskrit and Egyptian Hieroglyphs which says "Let these be guidestones to an age of reason." 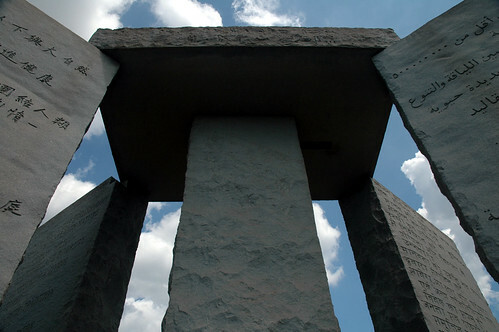 The monument often referred as "American Stonehenge" is about 6m high and consists of six granite slabs - one slab in the centre, with four arranged around it and a top stone above the five slabs. The slabs orientation is based on the Sun's yearly migration. The centre column features a hole through which the North Star can be seen regardless of time, as well as a slot that is aligned with the Sun's solstices and equinoxes. 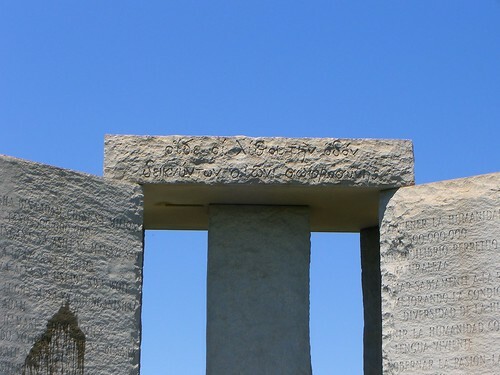 A small aperture in the capstone allows a ray of sun to pass through at noon each day, shining a beam on the centre stone indicating the day of the year. The guidestones have also been subjected to vandalism. Interesting. I'd never heard of that before.